This is the seventh revision page of the family&friends chart explaning who is who in our family&friends group and how they are related to eachother. Let me start with the name and the logo of our group. It is called “Euro Brat Pack”. Ok, it is quite obvious that I’m European as is my wife, partner, slave and owner Jenny (laylady.lay). So that explains the “Euro”. When I founded the group I was collared by Yasmin Heartsdale, who coined my Seconed life during my first years inworld and who owned me for more than 3 years as her sub, her brat. Her family was called “Yasmin’s Brat Pack”. Yasmin is from the US and I saw her not as much as I wanted to which is one reason why I was quite independant although I was owned. Quite soon after my collaring I collared Jenny and began to build my own family, first within Yasmin’s family. I founded the group and looked for a logo. 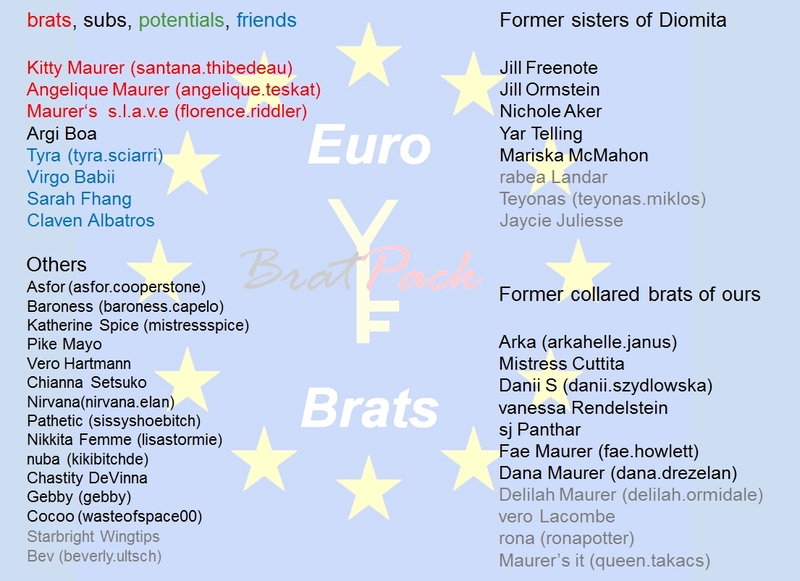 I seleceted the European flag and added the symbol of Yasmin’s Brat Pack into the middle of the stars. Done. The family&friends group was restricted to my collared subs and to the members of Yasmin’s family as we were all part of her larger family. Jenny became my married slave and partner and nowadays owns my collar – making us mutally owned. We let the group grow, then decided to keep it restricted to subs only, then added friends again. We have many friends beyond our group of course and being not in our group doesn’t mean, that you’re not a friend of us. Today the group is for our family and for those we have or had a close relationship. So who is in the group? Last but not least there are a handful of friends, who are in our family&friends group for different reasons. I won’t go into details. There are also some potentials subs among this group of friends. But we had too many disappointments lately with subs who showed themselfs promising but then left for weeks and months all of a sudden without any fore warning our message. And as I too lazy to revise this page with potential subs coming and going, I added them here. I thought a lot how to make a chart of all family&friends group members. But I admit that I had no real good idea. What I came up with is the above list of names, grouped into categories. I also grayed out those, who hardly show up anymore. Some of the accounts of these friends are still active and every once in a while one of them show up, but there’s no real contact anymore. Other accounts have been removed but their names are kept in our memories.